Sitting in a beautiful, tropical setting amidst the city of Siem Reap, Angkor Riviera Hotel is just 10 minutes away from Siem Reap International Airport and Angkor Temple. 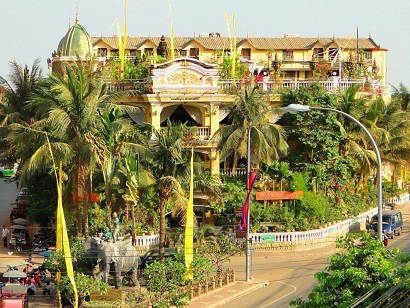 Offering an excellent location, the hotel gives easy access to learning the culture and traditions of Cambodia. Featuring 191 luxurious rooms, the interiors are built in a Khmer style offering modern facilities and a comfortable environment. Hotel facilities include a swimming pool, massage treatments, spa, business center, gym, meeting room, and banquet room. A lovely place of stay, the majority of the rooms also offer splendid views of the river. This beautiful resort is set amid the historical town of Siem Reap, close to the magnificent Angkor Temples and a mere 15 minutes from the international airport. With its accessible location, Borei Angkor Resort & Spa makes a great base for all travelers to looking to visit the city's ancient sites. All rooms are fully-equipped and decked out in stunning Khmer style. The hotel has a business center and library, offering secretarial services, photocopying, Internet access, and faxing. On-site facilities include a fitness center, swimming pool, whirlpool, spa and massage, shopping center, and currency exchange. The tour desk can arrange such activities as elephant trekking, cultural shows, mountain biking, or visits to orphanages. Conveniently located in Siem Reap, Terrasse des Elephants Hotel & Restaurant is a great base from which to explore this vibrant city. Set 0.02 km from the excitement of the city, this 4-star hotel commands an excellent location and provides access to the city's biggest attractions. For those of you who want to venture out, Blue Apsara Vintage Store, Blush Boutique, Lemongrass Garden Beauty & Massage are just some of the attractions available to visitors. At Terrasse des Elephants Hotel & Restaurant, every effort is made to make guests feel comfortable. To do so, the hotel provides the best in services and amenities. For the comfort and convenience of guests, the hotel offers free Wi-Fi in all rooms, 24-hour security, daily housekeeping, taxi service, ticket service. The hotel features 17 beautifully appointed guest rooms, many of which include television LCD/plasma screen, internet access – wireless, internet access – wireless (complimentary), whirlpool bathtub, air conditioning. The hotel's recreational facilities, which include outdoor pool, diving, fishing, spa, massage are designed for escape and relaxation. With an ideal location and facilities to match, Terrasse des Elephants Hotel & Restaurant hits the spot in many ways.. Whether you're a tourist or traveling on business, Ree Hotel is a great choice for accommodation when visiting Siem Reap. The hotel lies 1 km from the city center and provides accessibility to important town facilities. Also within easy reach are Senteurs d'Angkor, Cambodian Cultural Village, Top Town Club. 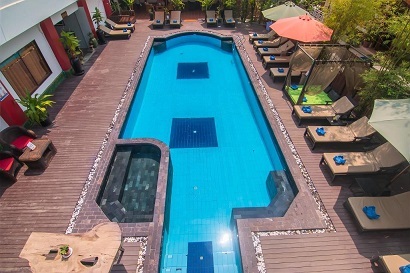 Take advantage of a wealth of unrivaled services and amenities at this Siem Reap hotel. The hotel offers access to a vast array of services, including 24-hour room service, free Wi-Fi in all rooms, 24-hour security, convenience store, daily housekeeping. Ree Hotel is home to 141 bedrooms. All are tastefully furnished and many even provide such comforts as television LCD/plasma screen, additional bathroom, bathroom phone, carpeting, clothes rack. The hotel's recreational facilities, which include hot tub, fitness center, sauna, golf course (within 3 km), outdoor pool are designed for escape and relaxation. When you are looking for comfortable and convenient accommodations in Siem Reap, make Ree Hotel your home away from home. As the winner of Cambodia's Leading Hotel in 2011 and 2012 by World Travel Awards, this luxury hotel features amenities and services that could keep the most discerning guest comfortable, relaxed, and satisfied. From the spa treatments and saltwater swimming pool to the technologically advanced conference rooms, the Prince d'Angkor Hotel & Spa’s priority is to meet any and all expectations. Although a bus service is available for sightseeing around Siem Reap, the hotel’s central location allows access to several famous venues. Bicycles are available should the urge to travel to nearby locations like Angkor Wat or Angkor Tom arise. The hotel is family friendly as the kids can spend the day playing in the children’s pool. 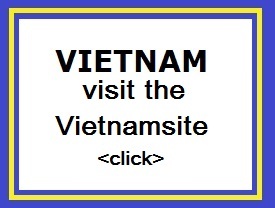 Siem Reap International Airport is about 15 minutes away, and the hotel arranges drop-off and pick-up upon request. 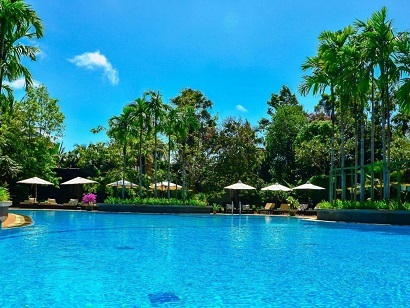 All things considered, Prince d'Angkor Hotel & Spa is excellently located, well appointed, and reasonably priced. 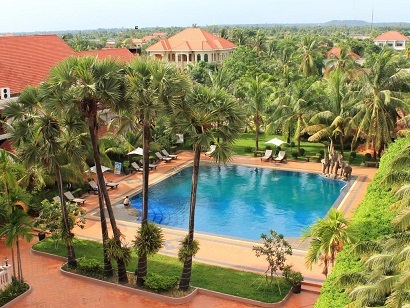 Clean, simple, and elegant, Mekong Angkor Palace Hotel is set in the heart of Siem Reap, just a short drive from the Angkor Wat and major cultural attractions. A few minutes stroll and guests will find local souvenir shops, restaurants & bars, and even nightclubs! 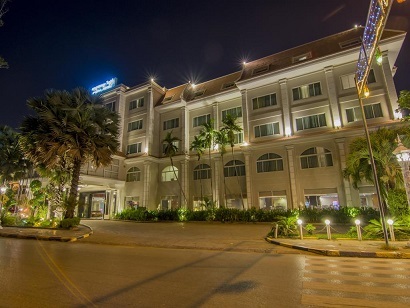 Mekong Angkor Palace Hotel also boasts well designed, spacious, and fully appointed rooms, guaranteeing a great stay. For leisure, guests can take a dip in the pool, dine on-site, or even chill out at the hotel's bar. Excellent for travelers looking for a quality budget accommodation, Mekong Angkor Palace Hotel is also known for its professional service.